So who is Elan and why haven't you heard of them before? Wow, have I disappeared for a season. I have been there - just behind the scenes composing some new patterns. I did LOTS of raw edge applique and researched both fusible web and scissors for cutting applique. 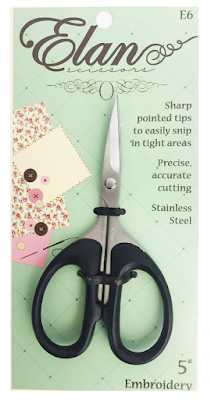 AND found the Elan's Sharp Point 5" Embroidery Scissors win in the scissors category. Yes, Elan wins again! So who is Elan and why haven't you heard about them before? Who -- Elan is a house brand of United Notions/Moda Fabrics. Why haven't you heard of them before? -- I can only guess. First of all, they don't sell direct - they are a house brand. And perhaps the competition is so strong in the scissors industry and perhaps United Notions concentrates on their other great products that 'pass through' easier than the scissors market. I am sure they have their loyal customers - like me - I buy them at my local retailer if possible or online. I have bought four different Elan scissors, the 8" Dressmakers - I love, and the 5" Embroidery - I love. They cut right to the point! I have also bought the 4" Embroidery and the Hobby Scissors with Florine, both are worth their great price point. The final pair I really want is the 5" Applique Curve Blade. I am going to put them on my 'Wish List' after writing this post.